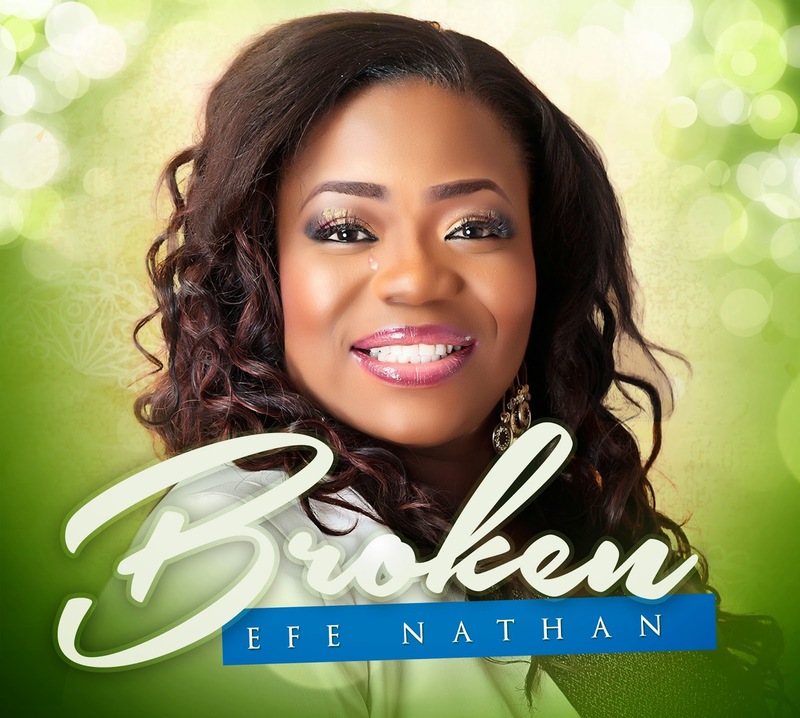 Efe Nathan, one of the most respected and recognisable music ministers in Nigeria, has released her new album titled 'BROKEN', and confirms that she is madly in LOVE. After the stunningly successful release of her last single 'Nobody Like You' in late June 2014, the 'BROKEN' album is regarded as a master class of lyrical content, and creative awareness in music production. It contains five (5) new tracks and thirteen (13) tracks from her 'New Level' album, which were not properly introduced into the market previously (because of piracy), totalling 18 tracks in all. "My fans can now take me home legally (LOL), enjoy the work and be blessed. My Marketer and Distributor, Tony Umeh (Honesty Music) has done a great job so far, and the album is now available on the streets of Lagos and other parts of Nigeria. Just ask anyone selling audio CD's that you find in traffic, book shops or anywhere for 'Efe Nathan's "BROKEN' Album', and keep asking till he/she gives it to you. Make sure its the 'BROKEN' album. Please go get the album, it will bless you, i am soooo excited." - Efe Nathan. The album contains songs like 'I Declare (Medley)', 'More', 'God You Rock ft. JFC', 'I'm In Love With You ft. J-Treash', 'Nobody Like You', 'Still Within The Flow', etc. This album captures her growth spiritually, an acquisition of new genre styles, and puts her firmly into the international urban music gospel industry. Great songs like 'God You Rock' which features the amazing vocal artist called JFC, and 'I'm In Love With You' are just two examples of the shift upwards in her eclectic nature. The album will be available for purchase on iTunes and other digital media shortly, to allow her fans all over the world to be able partakers of the minister called 'EFE NATHAN'. On issues of her relationship, and the reasons for dedicating this song to 'her bobo', Efe Nathan best explains it all in her new single called 'I'm In Love With You', and goes further to mention 'His' name severally in the song composition. She features her music producer and rising gospel artist J-Treash in this intimate song. The blend of voices, the power of the message, the simplicity of the production, and Efe Nathan's usual 'X-Factor' just makes the song an instant hit. J-Treash adds a sweet presence to this huge praise song, and makes it complete. Efe Nathan says "Everyone who identifies with being in love will be able to relate to this song. You just feel something so very special when you know the One you love has got your back too. I am hopeful that it will bless you". Efe Nathan had initial abstained from too many local and international invitations to minister, (home and abroad), due to her wanting to conclude this album work. Now that the album is done, she says "I am so ready to take the message to the world now. I didn't feel a 100% ready before, but with the recent situation, events and scenarios i have been through, they allowed me to be 'broken', and some depth-full songs were borne. I am so grateful for everyone who was part of that, and so ready now to be a stronger vessel for God". Efe Nathan would like to thank all her fans, friends, family, pastors, management, Magic Entertainment Inc, and everyone else, who stood by her all these years. "Una know una sef na (LOL, Kisses, & Hugs)" - Efe Nathan. The 'BROKEN' album from Efe Nathan is out on the streets now!!! You can also call these numbers, +2348023065504 or +2348064346288, to get a copy now.